Boy do I have a treat for you today! A part of my Korean haul, A set of Etude House polishes that are meant to create a Jelly Syrup look; something that is ever-so-popular in Asia. The polishes are: super sheer base jelly colour (applies all over) middle gradient color (middle of nail and to the tips) and the finishing glitter, which applies to the tips. They're all super sheer so layering them looks like a flawless gradient and the glitters are opaque enough to show up within a single coat. My favourite would have to be the middle polish - translucent glitter with tiny pieces of mylar flakies, suspended in a purple jelly. I could not capture it properly in the photos, but there's also invisible glitter, flashing blue and pink. Seriously, it's amazing! 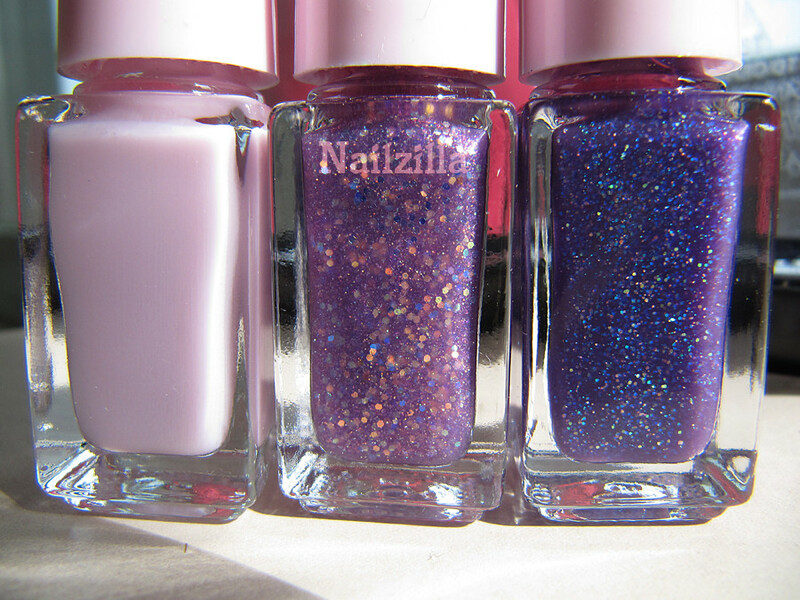 I want to try layering with these polishes at some point, since they're so versatile. There's other versions of this set, including silvery white, pink, gold, and I think blue (?). The glitters that come with these are different, but I'm glad I got this one! These are some of the most unique glitters in my collection. This manicure looks beautiful! I better try doing a glitter gradation one of these days!